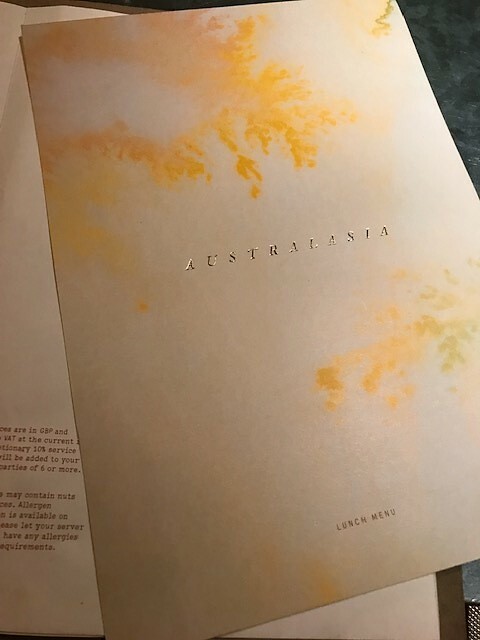 When I heard that Australasia in Spinningfields, Manchester, has launched a new menu just in time for Spring, I was eager to try it. 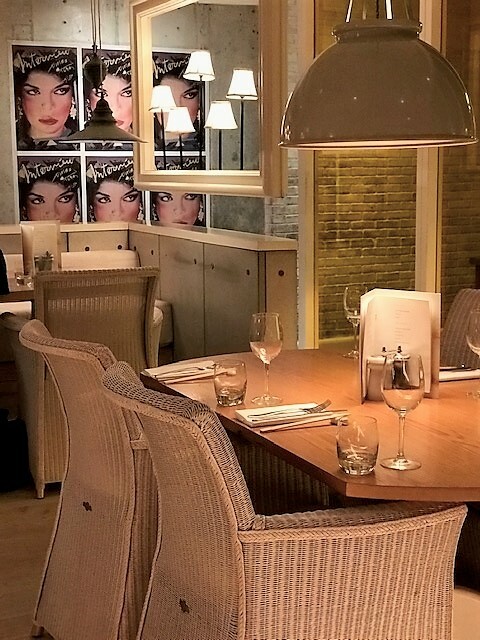 You see, Australasia actually makes it into my top 5 restaurants in Manchester list, mainly for it’s extensive listings of sushi variations, Thai and Asian infused dishes, and of course, it’s glamorous decor. So myself and my friend headed to the little glass pyramid which sticks out of the floor in-front of the Armani store, for a 1 pm lunch time sitting. The food here, in my opinion, is consistently good, and with a lot of attention to detail and effort put into every dish. 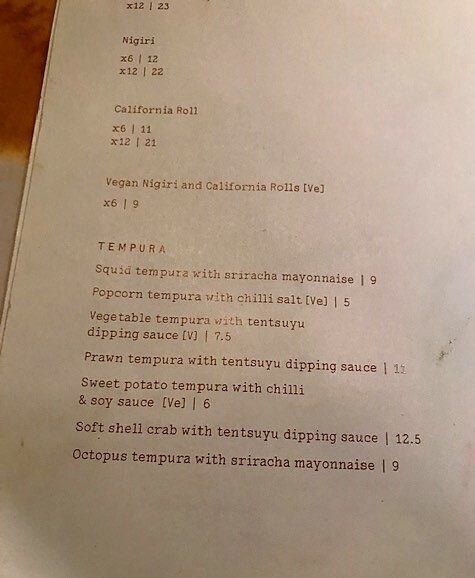 The menu is mainly split between sushi and tapas-y style dishes, but you can get your main plated meals too. We went for four small plates and a cocktail each, which I would say for a lunchtime sitting is more than enough for one person. I mean, don’t get me wrong, i could have devoured a fifth dish. But only out of sheer greediness and not so much hunger. 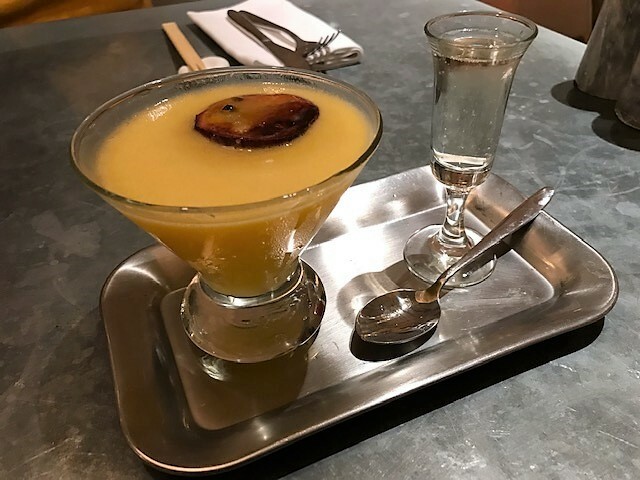 I went for Australasia’s version of the Pornstar Martini, which as expected, was presented elegantly and tasted strong yet sweet. Then, we browsed the menu, and I looked out for some of the new Spring additions. 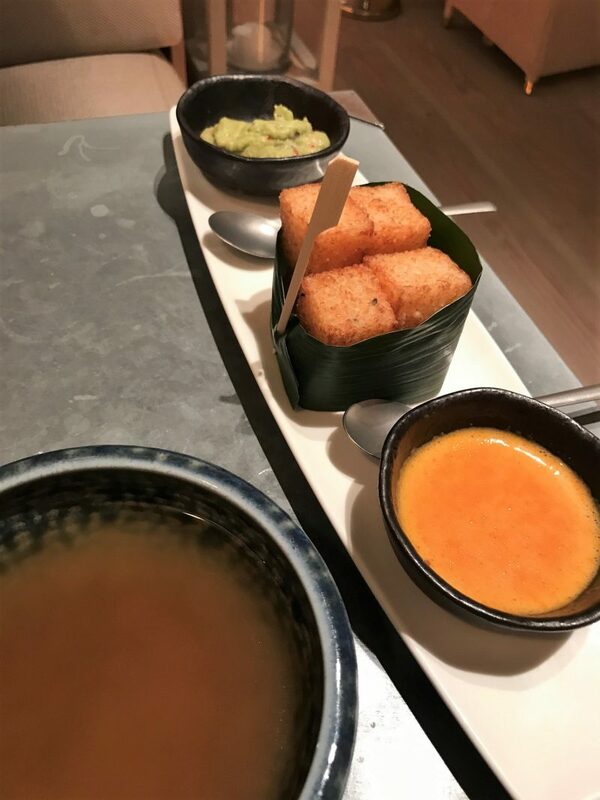 Some new delectable dishes I spied on the small plate menu included the Sweet Potato Tempura, which I clocked straight away and made sure I added to my order. I always like a nice, crispy vegetable addition, but it’s rare to see sweet potato done in this way, which was great to see. Other newbies that graced the tapas style menu included Mongolian Lamb Cutlets and Roasted Baby Aubergines. 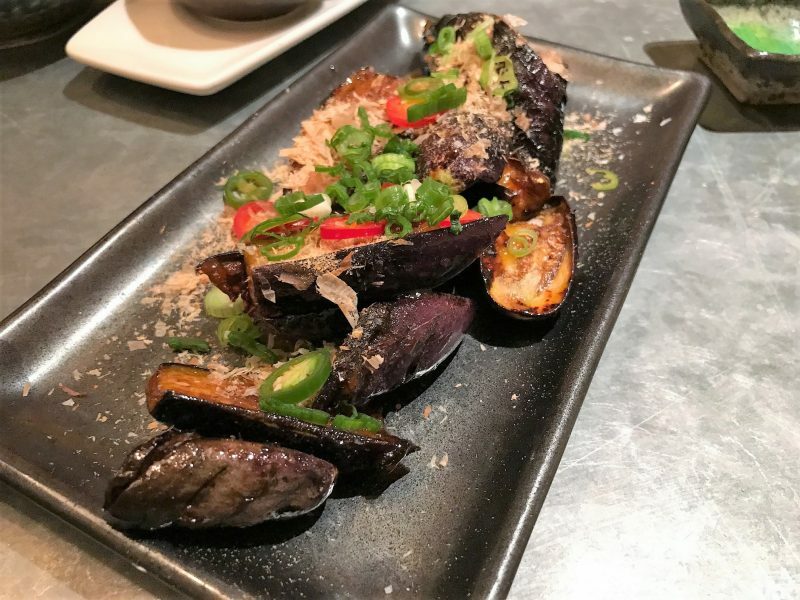 My guest decided to try out the Baby Aubergines, which comes with caramel miso and katsuobushi – an interesting twist on an aubergine dish (I do get fed up on seeing it topped with red sauce and bechamel!). 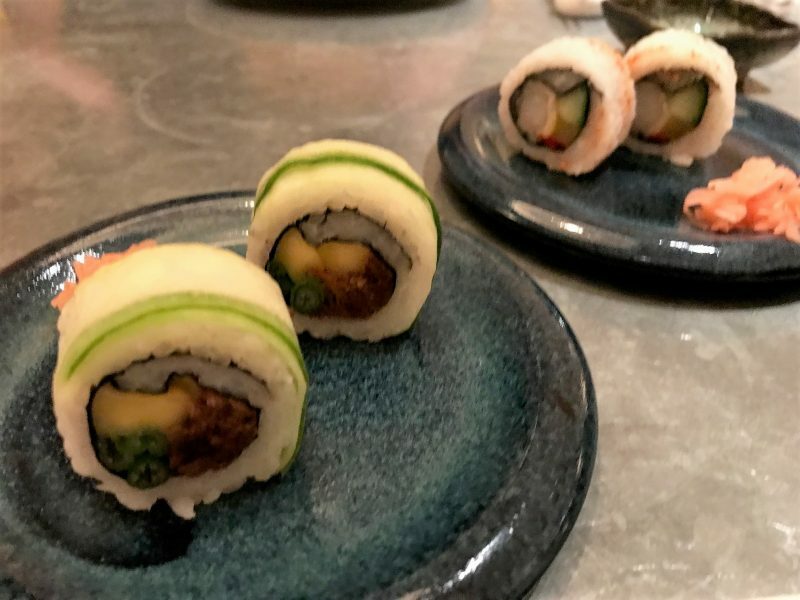 Some other newbies we spied included twists of favourite classics, like the Blackened Cod in Roasted Hobo Leaf, Seared Teriyaki Beef with Sweet Soy and Spring Onion and, of course their sensational selection of Sushi and Sashimi remain on the menu. 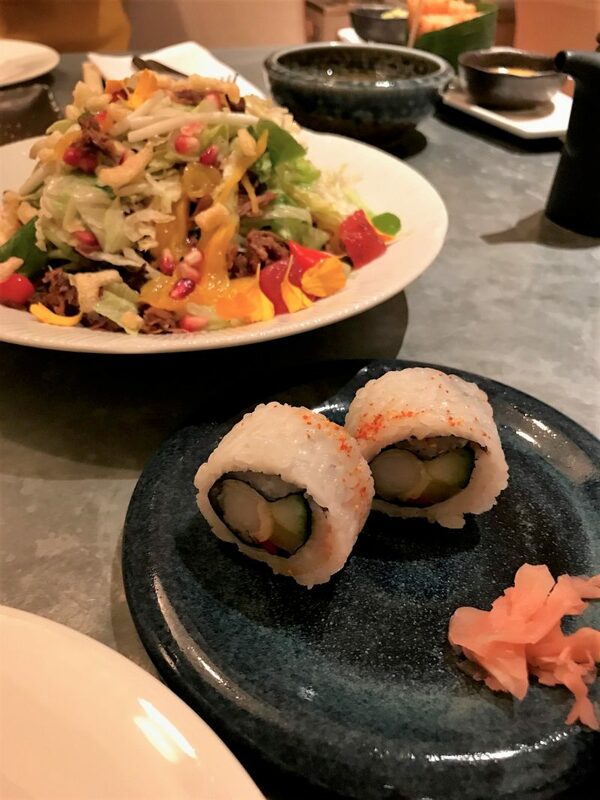 I’m a huge sushi fan, and one of the reasons I love to indulge in the sushi offerings at Australasia is because they tend to get the mix of fresh and raw ingredients along with fried and veggie just right. 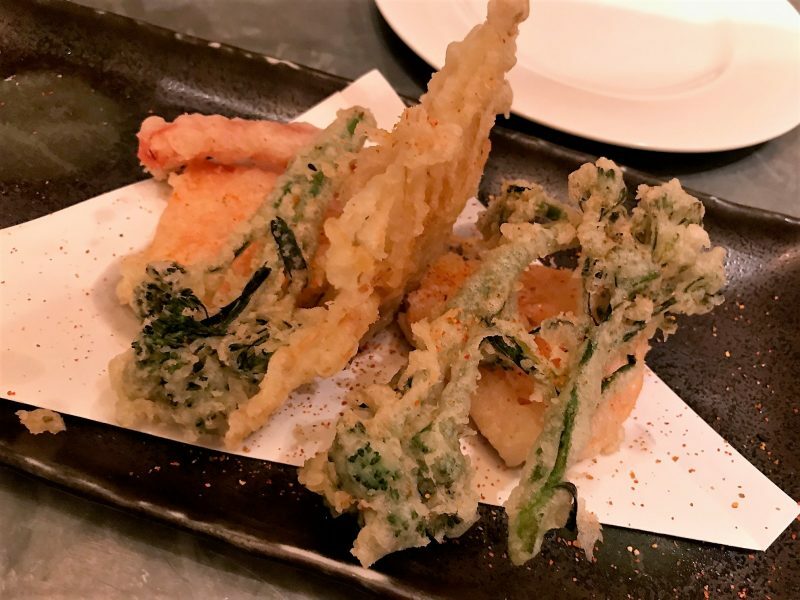 For example, the crispy Korean fried chicken and soft-shell crab Tempura Rolls are lightly battered versions, but then you have some key dishes like Salt and Pepper Prawn, and Asparagus and Watermelon. I went for the Peking Duck with hoisin, cucumber and spring onion, and the Salt and Pepper Prawn with spring onion and pickled daikon. 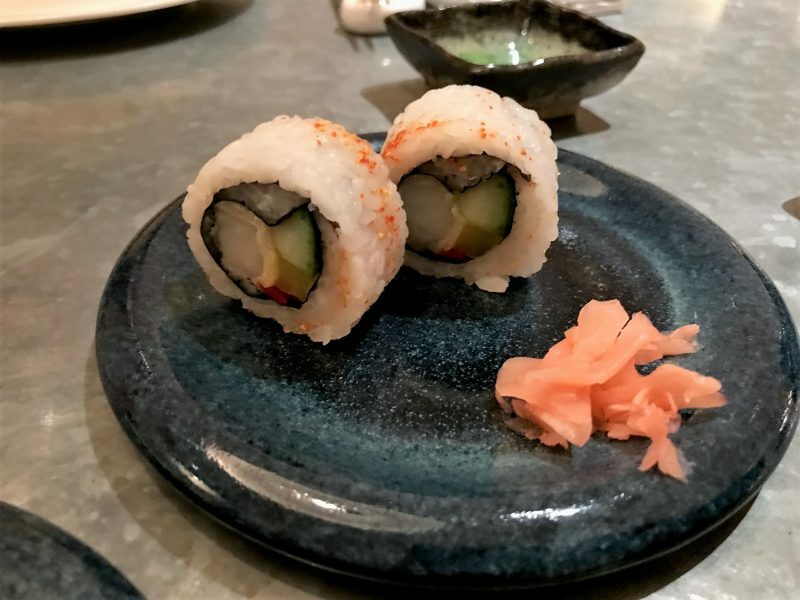 You get two large California rolls with a delicate Japanese dipping sauce called tentsuyu, which is more than enough to enjoy the delights of this homemade, soft sushi. 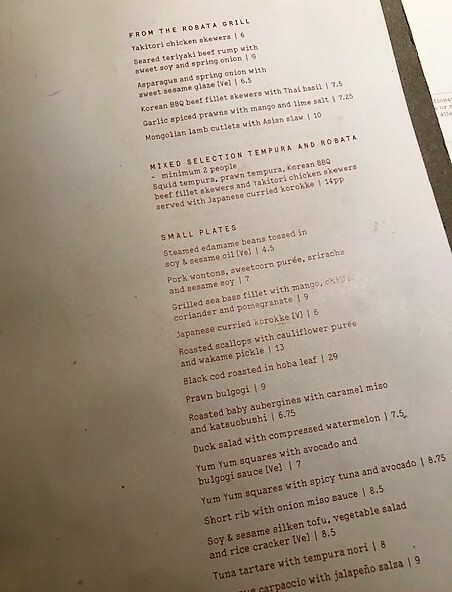 We didn’t order from the Robata part of the menu, but I did spot some new heavenly vegan options appear, such as the Robata Grilled Asparagus and Spring Onion. Short for robatayaki, robata is an ancient Japanese method of ‘fireside grilling’. When cooked this way, the asparagus takes on a fabulously nutty flavour, perfectly accompanied by the spring onions, and finished with a sweet sesame glaze. 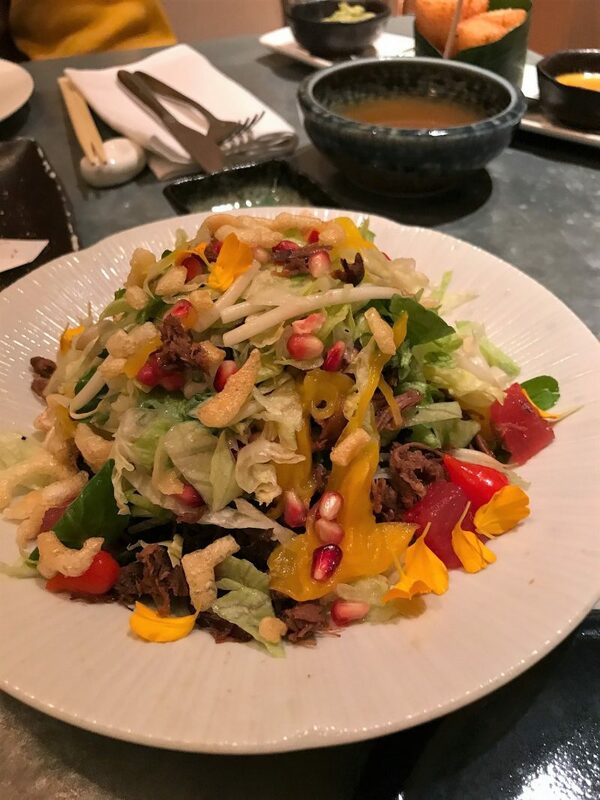 Alongside my sushi dishes, I thought I’d balance out my dishes by choosing a Duck and Watermelon salad – which my word, the portion size for this is certainly impressive! I have to admit I had to even leave a little as it was piled so high. The duck was juicy and full of flavour, working perfectly with the fruit enriched salad. 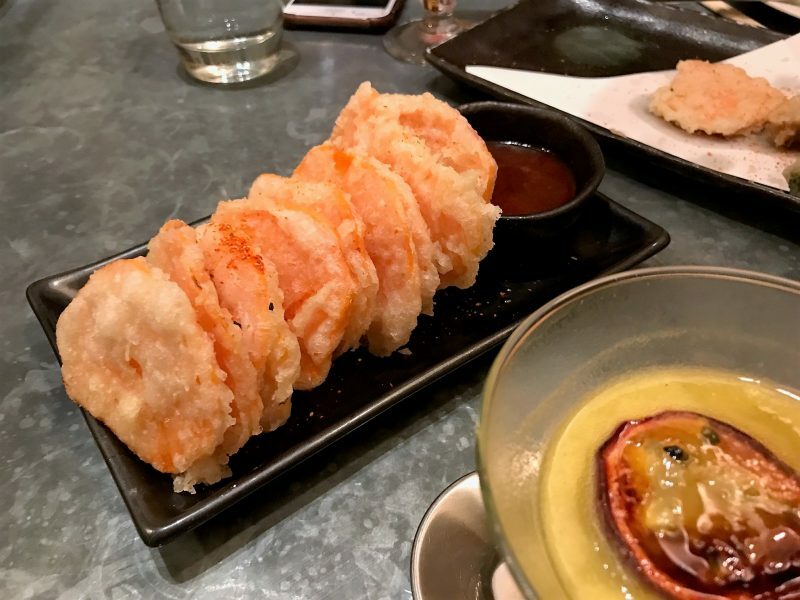 My fourth dish I picked was the Sweet Potato Tempura, as mentioned earlier. Now imagine slices of soft sweet potato wrapped in a crispy and crunchy coating, so you get the benefit of both textures in one bite. 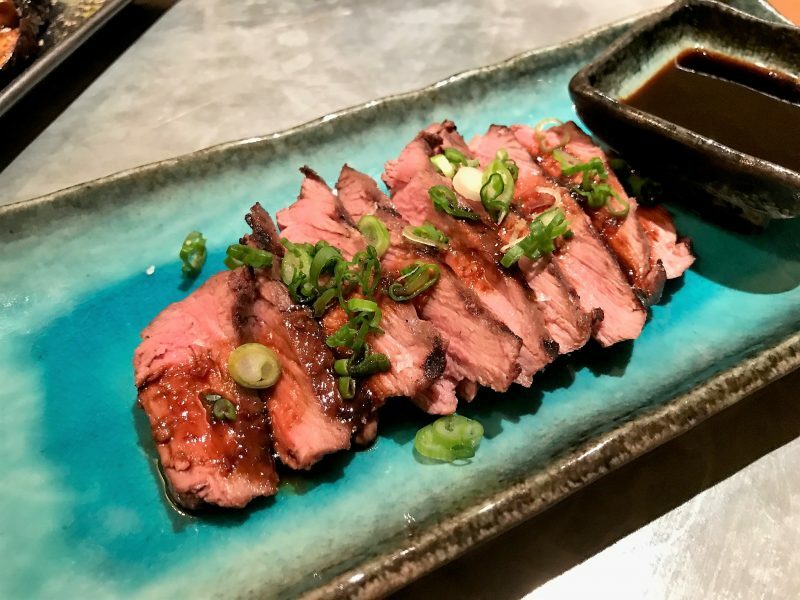 The dish above is the Seared teriyaki beef rump with sweet soy and spring onion. Cooked medium-rare, these beef slices are succulent, fresh and super tasty, making this a delightful plate for the big meat eaters out there. 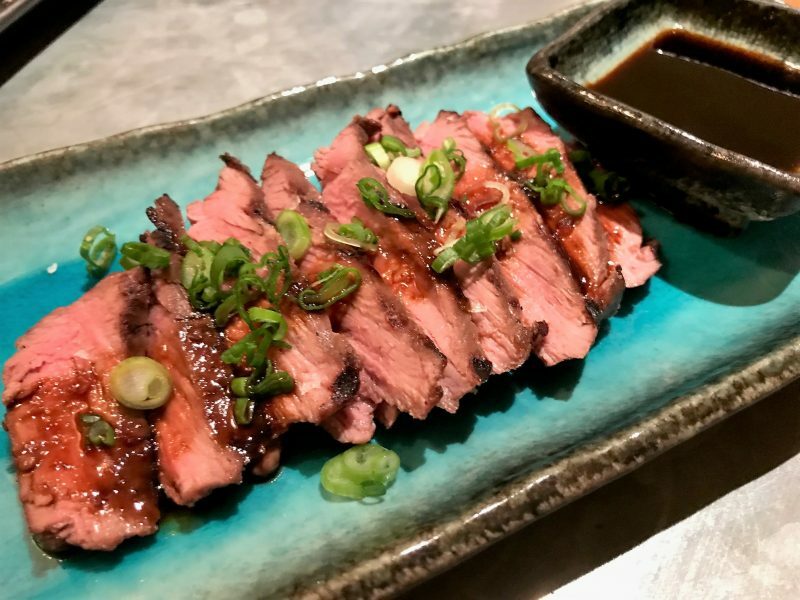 The sweet soy and spring opinion delivers that Asian influence to the beef, delivering full flavour. And below is the new Baby Aubergine dish…. top marks for presentation! I have to say this dish was a lovely was to enjoy aubergines. 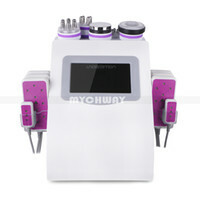 Now for the dish in the below photo. This was one I have to give credit to my friend for ordering. 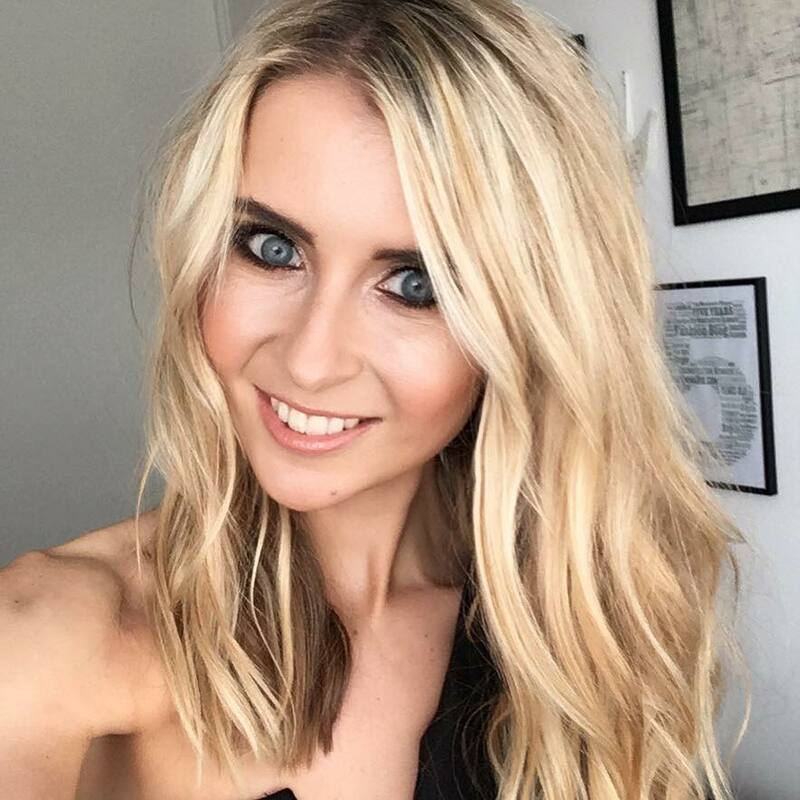 She picked the ‘Yum Yum squares with avocado and bulgogi sauce‘ – a vegan option on the menu. 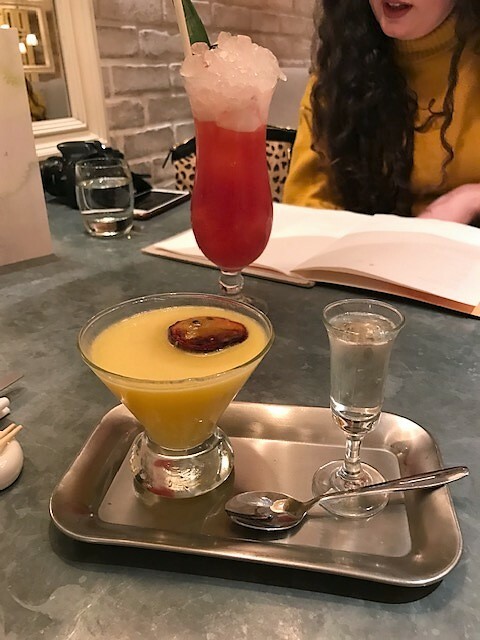 Now I didn’t actually know what to expect from ‘Yum Yum’, but didn’t even think to ask, and quickly looked at everything else on the menu. I have to say this dish was possibly the most delicious one I’ve tried, purely down to being so unique, dense, rich and tasty! I asked the waitress how it was made, and it’s actually made up of steamed sushi rice packed into lightly fried chunks. 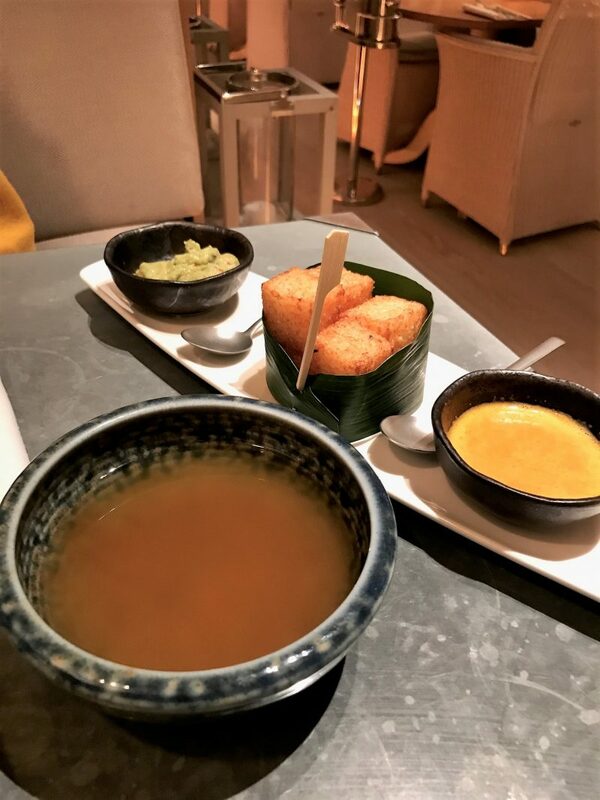 And is it even a proper Asian influenced tapas lunch if we didn’t indulge on Tempura Veggies, as below? It’s hard for me to pinpoint any negatives about Australasia, as I swear by this place and feel overly satisfied every time I leave. From the extensive menu choices, the delightful drinks menu, the ambiance, the decor, the service, and of course, the quality of the food. 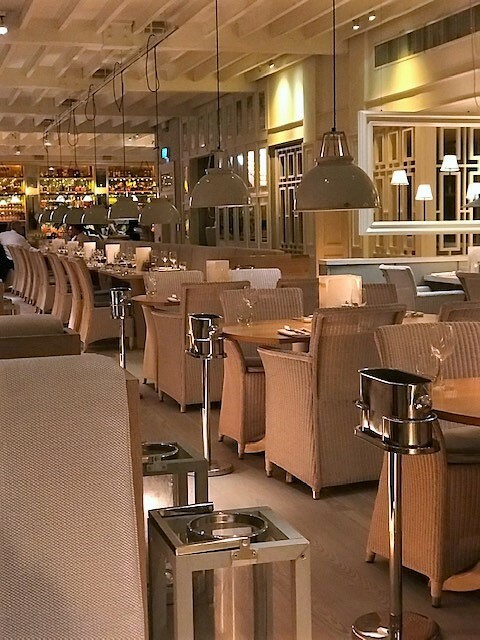 It can be a slightly pricier place to dine in Manchester, but I wouldn’t expect anything less when you consider all of the above. It’s definitely an exquisite dining experience for me, every time I come here. You can kind of work to your budget here though. Price points range from around £5-£29 for dishes, and you can go as extravagant or as low key as you like. Sadly I had to dash off to a meeting which meant skipping dessert. But mark my words. I’ll be back.